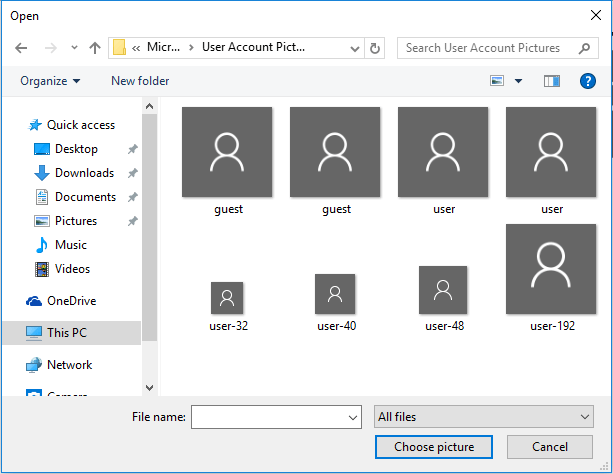 Beginning from Windows 8, and continuing to Windows 10, user account picture, also known as user profile picture or user avatar, has been made more prominent in Windows opearting system to allow Windows users more personalization option. You can now see your account picture on the sign in screen where the thumbnails are shown next to the list of user accounts, above the user name when entering password, and is also shown on top of the Start Menu or Start Screen (at the top of left rail of Start Menu from Windows 10 Version 1607 onwards) where you can click or tap on it to sign out, lock the computer or change account settings. In addition, if you’re signing into Windows with Microsoft Account (MSA), the account profile picture will automatically be synced to the one set in the Microsoft Account. Changing the avatar of user account in Windows is easy. However, if you want to reset and restore the account picture to default picture, the approach is not so clear cut. Here’s the trick that allow you to reset and change back the account picture to default. You may need to show and display hidden files and folders (hidden items). Windows does not provide an option to reset or restore the account profile picture to default image, which is used when you don’t set any profile picture. However, you can always set your profile picture to be the default image in order to revert back to the default. In Windows 10, Windows 8.1, Windows 8 and Windows 7, the default account picture images are stored in the hidden system folder located at %SystemDrive%\ProgramData\Microsoft\User Account Pictures. Open the Start menu or Start screen by pressing the Start button or the Windows logo key. 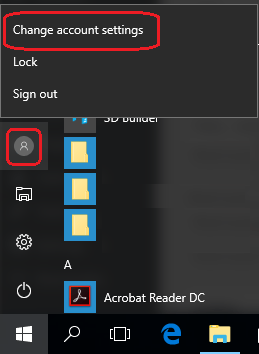 Click or tap on the user account name and picture, normally located at the top-left corner of Start menu, or top-right corner of Start screen, or the first icon on the left rail of Start menu or Start screen in Windows 10 Version 1607 (Anniversary Update) or later. Then, select Change account settings. Click or tap on Browse button under the current user avatar, or Browse for one under “Create your picture” in Windows 10 Version 1607 (Anniversary Update) or later. In the Open dialog, enter the following path in the address bar and hit Enter. Select any default user or guest image as your user avatar to reset your account profile picture. Another alternative is by deleting and removing the cached account image, which will make the user account picture blank. Thus it’s not really recommended. In the folder, there is a folder with the name of your user account’s SID. Take ownership and grant full access permissions to the folder. Rename or delete the folder. Sign out and sign in again, or restart the computer. The user account picture is now blank, and default user account picture is used on the Windows logon screen.